Carte blanche literally translated means “blank card”, a canvas ready for creation. But it also denotes “blank cheque”, signed with no numerical value yet filled in. 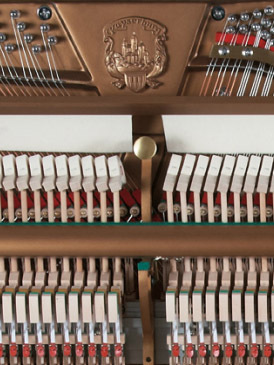 Such was the case for famed piano engineer Stephan Mohler and designer Lothar Thomma when asked by Pearl River to build a line of pianos with no holds barred. They were given creative and financial freedom to produce pianos similar to their heritage in Europe – having worked for both C.Bechstein and Steingraeber. Pearl River, presently the largest piano company in the world producing more than 100,000 pianos annually has impressed the musical community with the vast improvements in their pianos yearly with contributions from Thomma on both the Pearl River and Ritmuller lines. In the largest growth market in the world (China), they have become the undisputed champion surpassing even Yamaha in volume. For those of you who are sceptics, I can relate. It wasn’t until interviewing the CEO of Pearl River America, Al Rich at NAMM 2011 that I started to follow this company more closely. He stated that instead of hiring a small army of manpower to facilitate manufacturing, they chose rather to invest millions into automated CNC machines. So advanced is their manufacturing that companies like Steinway (with their brand Essex) have entrusted them to build their pianos. 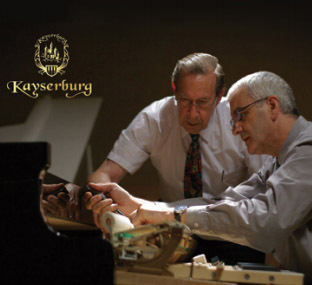 Fast forward to January 2013, Pearl River Piano Group (PRPG) released the all new Kayserburg line. PRPG successfully constructed a “company within a company” – a separate division to undertake building their highest level of instruments to compete with European makers for the most discerning pianists. So what makes a piano compete at this level? Only those with a background, namely Thomma and Mohler would know. What caught my attention was a blind ‘taste test’ in California this January where the Kayserburg went head to head against some of the most expensive pianos in the world. The results? 80% thought that it was the highest priced piano. 100% thought that it was within the top 2. In fact, the retail price was the lowest. It was stated by one pianist “the touch of this piano is so far superior to the others that it MUST be the most expensive one.” Why mention this piano? I think it’s going to be one worth watching in the coming years. Never before has China produced a piano that can compete on a Tier 1 (highest) level of pianos… all for a price that is by most considered reasonable. Grands to follow within the next year. My only caution is to not get the branding levels of Kayserburg confused. Apparently Pearl River has in past used the Kayserburg name in Australia. This new series is appropriately called the “Artist” series and is labelled in the top right corner of the cabinet (as pictured). The other Kayserburgs are apparently more similar to the Ritmuller line except with laminated soundboards. New Artist pianos have the model designation KA while the others are UH. They are vastly different pianos… and just wanted to clarify. 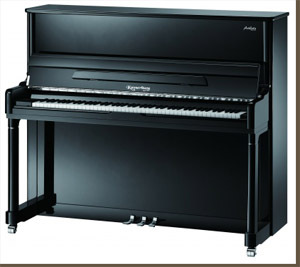 If you want to see the pianos in Piano Price Point, simply press the button below.